All machines are on free play! The only machines that are not included in the admission fee are tournament machines. These are also set to free play, but reserved for tournament players at all times. Cash, Credit Card or Debit will be accepted throughout YEGPIN. Some vendors may only accept certain payments. There are a number of ATM’s on site. ~ Tickets can be purchased for persons under 18 years of age but they will not have access to Friday Night VIP Party and/or Saturday Night YEGPIN After Dark events. 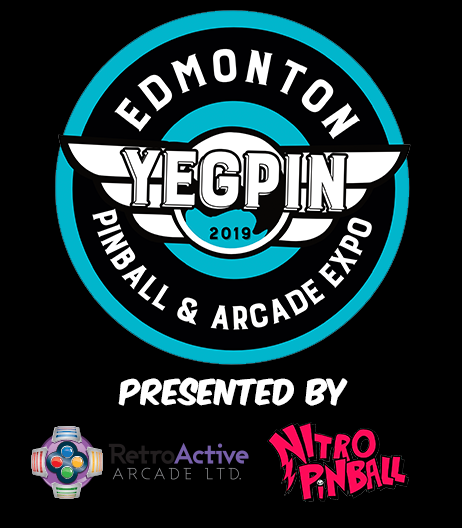 ~ You have to purchase one of our VIP Passes in order to register for the YCPC and Classics pinball tournaments. ~ All pre-sale tickets go on sale on December 15, 2018 and end on March 1, 2019. ~ Ultimate VIP and VIP Passes are limited to 125 total tickets sold and will be removed from purchase once limit has reached. ~ Weekend passes are good for the entire duration of the show during listed show times, they include entry into YEGPIN After Dark on Saturday night. ~ Individual day passes are good for one day during Normal Show Operating Hours, either Friday, Saturday or Sunday. ~ All tickets cover admission to the expo entry only. ~ Children 12 and under are FREE with paying Adult (2 children per adult limit) and must be accompanied by an adult in the facility at all times! ~ All tickets that are pre-purchased or sold at the expo are non-refundable.